Your pet's health and happiness depends on you and the food you choose. 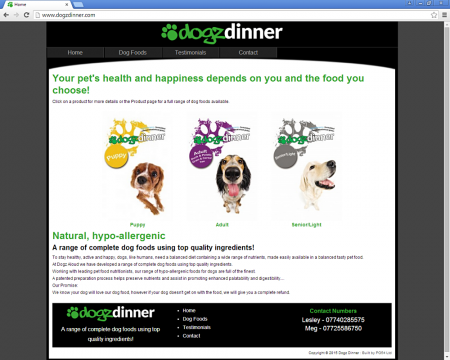 Natural and hypo-allergenic, Dogz Dinner is a range of complete dog foods using only top quality ingredients. What a nice looking site this turned out to be and we can only take partial credit. All logos and product images were provided by the client but it's the PG54 Content Management System that is used to build and render the pages in such an engaging way. We love dogs and so do Lesley and Meg who own and operate the site. They supply some really interesting and nutritious foods for man's best friends.